Horizon Landscape offers snow and ice management services for commercial properties in Bergen County New Jersey. 24 hour office staffing during a storm for your convenience. Large fleet of snow plows, pusher boxes, loaders and de-icing spreaders. Member of Snow and Ice Management Association (SIMA). Weather monitoring services for long range and moment by moment storm updates. Certified snow totals at the completion of the event. Fully insured with Workman’s Compensation and Liability. Flexible pricing structures for fixed seasonal pricing or per event pricing. Mobile technology to manage routes and provide detailed records of snow services. Detailed record keeping provides evidence of your snow program in the event of a claim. Horizon Landscape is a dedicated leader in the Snow and Landscape Industry. Read our featured story in the February 2019 edition of SIMA Magazine! Depending on the level of service you require, we begin snow plowing at a pre-set depth or when the snowstorm has ended. We may also begin service at your site if a significant amount of precipitation has accumulated by the time you need vehicle access to your property. In order to accommodate our clients, our office is staffed at all times while our snow plows are out (even in the middle of the night). If you have a special need or request, please call at least one hour in advance so we can service you best. Many of our commercial clients choose to have their lots pre-treated to prevent bonding of the snow and ice to the paved surface. Following a snow or ice storm we will treat commercial sites with de-icing material to restore your property to a safer condition as soon as possible. Pre-treating to minimize bonding of snow or ice to paved surfaces. Treated salt that is safer for our environment and your property. Multiple trucks for applying de-icing material. Calcium Pellets or treated salt for walkways. Liquid De-Icing (Brine) as conditions merit. Some clients choose to have us use salt for de-icing that has been treated with an organic-based product made from natural renewable sources. It offers a lower freezing point, enhances corrosion protection, is biodegradable, and environmentally friendly. Salt will be applied as a traditional granular product or in liquid form (Brine) as conditions merit. Brine, salt in liquid form, is safer for the environment and is used by all Municipalities and the State of NJ. Horizon Landscape uses brine to selectively treat sidewalks, parking areas and roadways for ice and snow. Brine is a liquid solution of dissolved salt, the same as used by the State and many municipalities for snow and ice control. Brine enables us to be better stewards of the environment by reducing overall salt usage. It reduces the amount of active salt required to control ice which later enters and pollutes our streams, lakes and reservoirs. The application is direct and does not pile up against the curbing and sides of buildings which later washes into our waterways. Brine can be applied several days before a storm where it can wait until needed to begin working. Once dry it does not stick to shoes and track in doors like traditional rock salt or calcium chloride does. It activates as soon as the first snowflakes fall which helps to minimize slippery conditions and prevent or delay snow accumulations. Snow and ice management services are provided at a quoted flat price for the winter season. This pricing structure may or may not include a seasonal snowfall “cap” before reverting to another price structure such as a per push. Seasonal pricing requires a minimum 3-year commitment. Seasonal pricing will be affected by Hours of Operation, Level of Service Desired and whether you prefer a Fixed Unlimited Seasonal Pricing or Flexible Limited Season Pricing with Minimum and Maximum Events. Snow management services are performed and clients are billed at a quoted rate per site visit and push. This structure can work well with high traffic sites such as retail plazas, medical centers and bank branches where it is not desirable to allow precipitation to accumulate. Snow management services are performed and billed at a single rate for any given snow fall amount regardless of how long the storm continues, up to a maximum event window of 24 hours. The pricing is based on the number of inches of snow that has fallen. 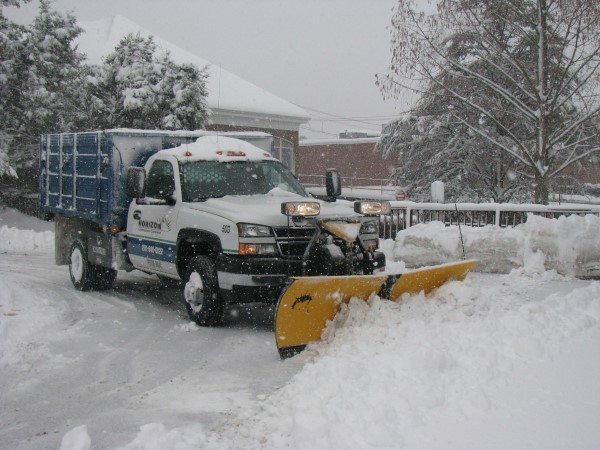 Located in Wyckoff, New Jersey, Horizon Landscape Company offers over 40 years of experience in the commercial snow and ice management industry. Call Us Today! Read our featured story in February 2019 edition of SIMA Magazine!